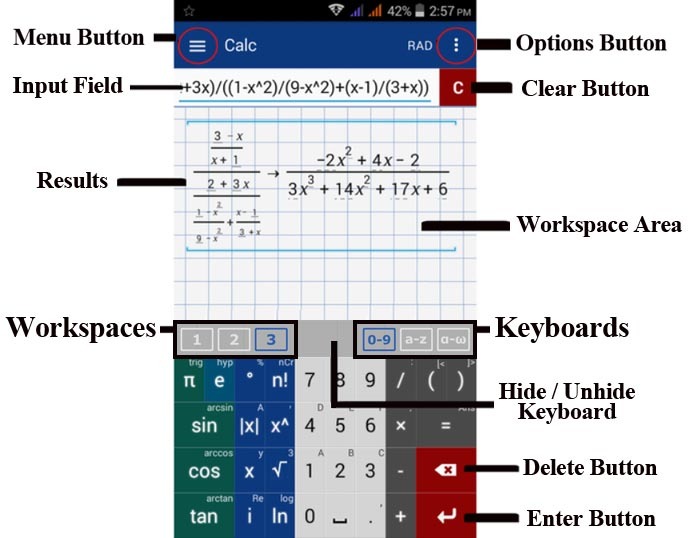 The calculator window has the following parts: a menu button, an input field, an options button, a clear button, a workspace area, 3-9 buttons to switch workspaces, 3 buttons to switch keyboards, and the default keyboard display. Expressions and equations are typed into the input field. A new expression may be added by tapping the enter button (expressions are organized into rows/lines). You may change which expression you are currently editing by tapping it. Its arguments will automatically appear on the input field. The menu button allows you to switch between the four modes (Calc, Graph, Table, and Library with subsections, constants and functions) as well as Help and Settings. The options button allows you to: load files from library or open from file; save calculation results to library, save as text or save as image; send feedback to us; rate the app and invite friends to use the app. Graph window options button has additional fullscreen option. The clear button erases the selected expression. Holding it clears all expressions in the workspace. The workspace area displays each expression/equation along with its respective solution. The keyboards allow you to switch between the default (0-9) keyboard, the Qwerty (a - z) keyboard, and the Greek (a - ω) keyboard. The hide/unhide keyboard (the area in light brown between workspaces and keyboards) allows you to hide or unhide the default keyboard.. The workspaces allow you to switch from one workspace to another. Free version's calc and graph modes have 3 workspace areas each while Pro Version has at most 9 workspaces.